As athletes ourselves, we understand the value of raw, enzyme-rich foods that nourish the body and leave you feeling clean and energized. 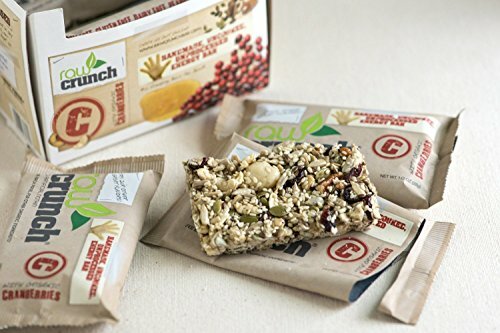 For this reason, we carefully chose the most nutrient dense combination of ingredients for our Raw Crunch Bars.The core ingredients in our Raw Crunch bar are organic, raw nuts and seeds. Their heart healthy omega 3 & 6 essential fatty acids nourish the body, soften the skin and actually promote weight loss. Rich in fiber, raw nuts and seeds support healthy digestion and help cleanse the body of old toxins. We then added antioxidant-rich organic berries or dark chocolate for their immune boosting and anti-aging properties. Finally, we used a touch of hand-harvested raw honey to hold it all together and a pinch of doctor recommended Celtic Sea Salt. There you have it, these are simply all of the ingredients in our Raw Crunch Bars, only whole raw food in its purest form. Every Raw Crunch bar is hand-made fresh with a personal passion for excellence and quality that only a small cottage manufacturer like us can offer our consumers. Enjoy! Sincerely, Ross & Kathy.Handmade Uncooked UnprocessedRaw Crunch bars are derived from nature and are not altered in any way, thereby maintaining their original concentrated nutrients, enzymes and potent antioxidants. Each flavorful ingredient is kept as fresh and nutritionally intact as possible. Nutritionally satisfying for natural appetite control Convenient mini-meal for on-the-go individuals, athletes and kids! Naturally high in fiber, heart healthy fats and bioavailable protein No added filler, supplements, flavoring, colors or preservatives.